Hampton Court bridge in 1753. The Castle Hotel on the left hand side has a sign which proves that it was then called The Prince of Wales. 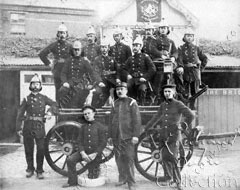 George Alderton (Capt) and members of East Molesey Fire Brigade, 1897. 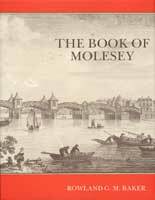 The Book of Molesey was originally published by Barracuda Books, now part of Baron, publishers of heritage volumes - maritime, military, transport, sporting and local. It is made available here with the kind agreement of Radmore Birch Associates.